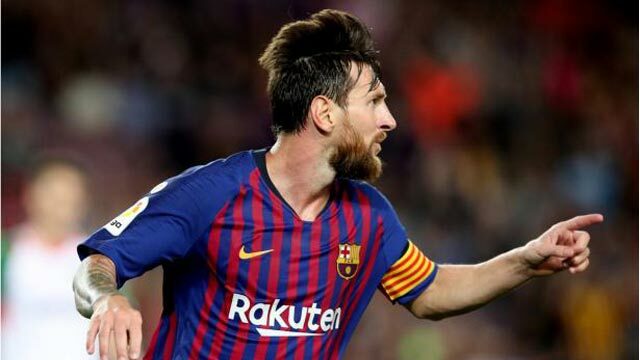 Madrid, Aug 19 (Just News): La Liga champions Barcelona began the new campaign with a 3-0 win over Alaves on Saturday with the help of a spectacular under-the-wall free kick from Lionel Messi, who scored twice, and a curling shot from substitute Philippe Coutinho. Barca had dominated the late kick-off at a quiet Nou Camp but again struggled to convert chances against a shrewd Alaves, who are the last team to win a league game at the Catalans' home, beating them 2-1 in 2016 and nearly repeating that feat last season before losing 2-1. Messi had clanged the crossbar in the first half from a set- piece and Ousmane Dembele forced visiting goalkeeper Pacheco to make an impressive save while Luis Suarez looked immobile and ineffective. Barca coach Ernesto Valverde brought on Coutinho at the start of the second half for Nelson Semedo, dropping Sergi Roberto from midfield to defence to give the team more creativity in a bid to open up the stubborn Basque side. Barca looked more incisive and dangerous but it still took a moment of genius from all-time top scorer and new captain Messi to break the deadlock.